Regular exercise boosts energy and creativity. So it stands to reason that an avid marathoner, hiker, and triathlete like Josh Sprague would have a very active imagination. His company is named Orange Mud, a nod to his favorite color and, yes, mud. He creates innovative problem solvers for adventurous folks, himself included. 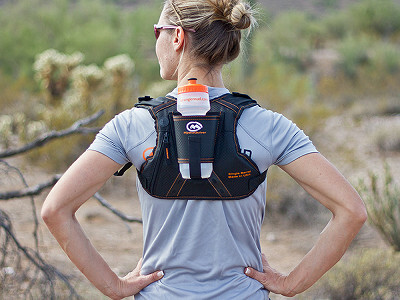 After a particularly dehydrating run, Josh's “hydration frustration” became inspiration for the Hydra Quiver, a vestpack designed with a back-mounted water pouch that tucks snugly between the shoulder blades, so the bottle won’t jostle. It leaves arms completely free for that extra push when running. Light and breathable, the foam padding provides support and comfort. Hidden pockets hold keys, cards, and snacks. The Transition Wrap is a large bath sheet that secures with a belt, perfect for discreet outdoor changes after a race, shower, or a day at the beach. A built in zipper secures it on the headrest of your car seat. All products are Made in America within 100 mile radius of Josh’s Southern California headquarters. Josh here from Orange Mud. Thanks so much for stopping by to check out our gear! Our designs are highly engineered for simplicity, durability, and to make your active lifestyle more enjoyable. Our “Innovation from Frustration” motto seems to fit quite well in The Grommet community as so many products on here appear to have been started for the same reasons. If you have any questions feel free to share below, we’d love to hear from you! Does thisHydraQuiver assist or improve posture? Would a 40 oz Hydraflask fit in the hydra quiver? I walk not run. @Ginny It looks like the diameter on the 40 oz is 3.6" which would be too big. The diameter that this is designed around is 2.9" bottles. Sorry! I live in North Texas where it is very hot in the summer. The HydraQuiver and Double Barrel seem like great ideas as carriers. The trick is how to keep the water bottles cool. I'v tried many that claim to keep water cool in hot weather but all have failed. Have you given any consideration to keeping the water cool? We have the Hottern Hell Hundred here in August (12,000 + riders) and believe me cool water is a big deal especially during training rides. @Randall Hi Randall! Couple of things here for you. First off, I agree, keeping water cold is brutal and hard to achieve regardless of the system. You can use any insulated bottle that fits in a bike bottle cage like Polar and the like. They work best if you freeze them in the freezer with them half full of water in them. Aside from that, our spacer mesh actually acts as a descent insulator to keep the bottle cool too. But when the fiery orb hits 100+ it's tough no matter what the solution. At least with our packs you can refill at aid stations frequently with ease with nice cool water. Thanks for answering Josh, Here in North Texas we've always used wool or cotton socks soaked in water as water bottle covers. It does work as long as the sock is wet but in our heat it dries out quickly. Then you have to pour your water on it to start the process over. I like carrying the bottles on the back. I plan to give the Double Barrel a try this summer. I'll let you know how it goes. Thanks again. Excellent! Initially, I thought you were in or from East TN, where the mud really IS orange. Our team's color is orange, too! I'm putting this on my wishlist for the long mountain treks. Best of luck and love your ideas! Regular exercise boosts energy and creativity. So it stands to reason that an avid marathoner, hiker, and triathlete like Josh Sprague would have a very active imagination. His company is named Orange Mud, a nod to his favorite color and, yes, mud. 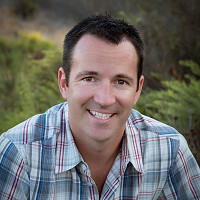 He creates innovative problem solvers for adventurous folks, himself included. 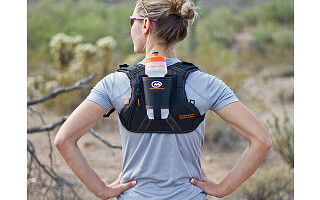 After a particularly dehydrating run, Josh's “hydration frustration” became inspiration for the Hydra Quiver, a vestpack designed with a back-mounted water pouch that tucks snugly between the shoulder blades, so the bottle won’t jostle. It leaves arms completely free for that extra push when running. Light and breathable, the foam padding provides support and comfort. Hidden pockets hold keys, cards, and snacks. The Transition Wrap is a large bath sheet that secures with a belt, perfect for discreet outdoor changes after a race, shower, or a day at the beach. A built in zipper secures it on the headrest of your car seat.